Only 3% of the world’s water is fresh water and most of that is polluted beyond use. The normal cycle of rain (rain seeps into ground, flows through rivers to oceans, evaporates into air getting caught by clouds, which move over land and rain) has been totally disrupted. For the first time in history, more people live in cities than the country, which means more pavement and less permeable land so rain water can’t return to ocean and be recycled. We also build communities bigger than local watersheds can provide water for. A perfect example is the lost city of Ubar, Oman, which collapsed into the desert sand as a result of over pumping water. Privatization of water is killing us. In Bolivia, for example, Bechtel Corporation gave citizens an ultimatum – pay for water or go thirsty. Even rain water was privatized and the people were prevented from collecting it for their own use. The countries army was forced to go against it’s own people to support the agenda of private investors from other countries. Corruption anyone? In Kenya the only thing they have access to drink are Coca-Cola products. This includes water so their only option there is Dasani. The tap water is undrinkable. But guess what – Coke costs 1/3 of the price of Dasani there so they’re basically forced to drink sugar. In Ghana, water only runs once per week, but they don’t know when so they have to open the tap frequently which they get charged for. Because of this they end up going to the river which has a cholera warning, but is free water. Here in America we have Nestle as a potential buyer of the Great Lakes. Where does it end?! This starts with us. 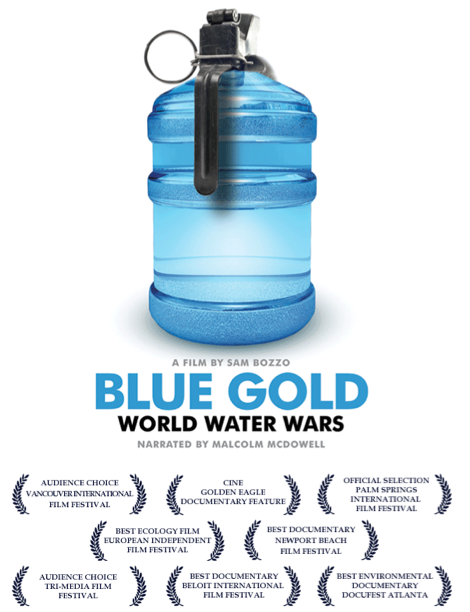 The film suggests a Blue Alternative, which begins with us saving our own water first, then continuing by helping global organizations like Ryan’s Well Foundation. There are so many things each of us can do to conserve water everyday from using low flow faucets, to drinking from Bobbles and not purchasing bottled water, of just simply not running the water when brushing your teeth. It may seem trivial now, but we’re a lot closer to a world water crisis that we might think. Watch the movie. Educate yourself on the issues. Entry filed under: Movies, Water. Tags: Blue Alternative, Blue Gold, Ryan's Well Foundation, Water Privatization, World Water Wars.